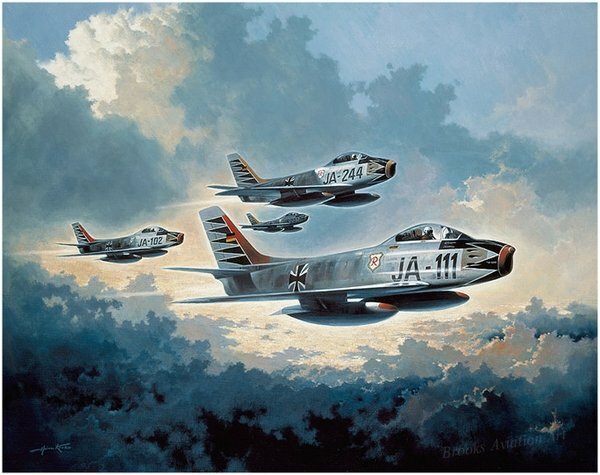 1961, the first fighter wing of the new German Federal Luftwaffe, led by the famous Ace of Aces Colonel Erich Hartmann, was named JG 71 Richthofen after another well-known German fighter \ace, the Red Baron Manfred Freiherr von Richthofen. Erich Hartmann returns from a mission in his JA-111. The nose of Hartmann's F-86 sports the black tulip, his personal emblem throughout World War II. This emblem is carried by all aircraft in his new fighter wing as a sign of loyalty to their boss.